Looking for a new job, new career? Alcohol and other drug / substance use disorders (AOD/SUD) counselors should use the FREE job network available here 24/7, FREE to employers and employees. possible Group coverage as needed! Bilingual in Spanish / English is preferred, but not required. ABC Programs is a California State Licensed Drinking Driver Treatment Provider. We are committed to providing the highest quality education and counseling services to those convicted of a DUI. We offer First, Second, and Multiple offender programs in Los Angeles County and First offender programs in Orange County. Services are provided in most cases to individuals ordered by the Court, County Probation or State Parole Agency or can be done on a volunteer basis. Clients are required to complete programs specified by State Law, where State Law and/or County regulations mandate both the content and length of program. Programs offered in both English and Spanish. f you are registered/certified looking please contact us with your resume to email above. For more information or if interested please email your resume to jobs@abctraffic.com or fax to 714-429-9910. Center Point DAAC (Drug Abuse Alternatives Center)is recognized as a leader in providing exemplary Alcohol and Other Drug Services providing best practice treatment services for individuals and families. Our mission is Turing Lives Around By Providing Healthy Alternatives to Alcohol and Other Drug Use. Center Point DAAC employees are committed to the values of service, integrity, excellence and teamwork. Center Point DAAC is currently recruiting for a full time Assessment Specialist. Apply to this ad via https://jobs.localjobnetwork.com/apply/add/36170832/1 or fax resume, cover letter and all required certifications/registrations to 707.571.2238. Please title your submission “Assessment Specialist Application”. Center Point DAAC (Drug Abuse Alternatives Center) is recognized as a leader in providing exemplary Alcohol and Other Drug Services providing best practice treatment services for individuals and families. Our mission is Turing Lives Around By Providing Healthy Alternatives to Alcohol and Other Drug Use. Center Point DAAC employees are committed to the values of service, integrity, excellence and teamwork. Apply to this ad via https://jobs.localjobnetwork.com/apply/add/36170829/1 or fax resume, cover letter and all required certifications/registrations to 707.571.2238. Please title your submission “Outreach Counselor Application”. Apply via https://jobs.localjobnetwork.com/apply/add/36170792/1 or fax resume, cover letter and certification to 707.571.2238. Please title your submission “Client Support Application”. Center Point DAAC is currently recruiting for one full time AOD Counselor and a Part Time Bilingual AOD Counselor. Experience working with a mixed gender treatment populationCenter Point DAAC (Drug Abuse Alternatives Center) is an equal opportunity employer. When applying to this position, please include a cover letter, resume and counseling certification/registration. You can also fax these documents to 707.571.2238, attention Recruiting. If you decide to fax your documents, please include the subject “AOD Counselor Application” in the subject line. Resolve It Now Drugs and Alcohol Assessments is seeking certified and licensed Substance Abuse Counselors to join our team of professionals in providing online substance abuse assessments. Counselor’s location is flexible due to the virtual nature of the administration of the assessments. Resolve It Now Assessments was formed with the mission to set the gold standard in online clinical substance abuse assessments and evaluation. Resolve It Now is a leading provider of online drug and alcohol assessment services. Our clients range from individuals/families, employers, attorneys, judicial entities, professional licensing boards, DOT, and consultation within the corporate sector. Resolve It Now operates on a set of values and ethical practices that ensure our clinical assessments and evaluations are of the highest quality to meet the requirements of every client. We provide our clients with services that are convenient to their busy schedules, save time, and maintain privacy, all while doing so at an affordable rate and maximizing the use of online technology. We assure professional, competent, and courteous customer care to all of our clients. Our drug and alcohol assessments feature the use of standard and proprietary diagnostic screening tools to rule-out bias and achieve accuracy. All diagnostic determinations are made utilizing American Psychiatric Association DSM-5 criteria. Visit www.CHAproviders.org to learn more and apply through our secure candidate portal. CV and cover letter may be sent directly to Melissa Kelley, CHA Provider Recruiter via email at makelley@challiance.org. CHA’s Department of Provider Recruitment may be reached by phone at (617) 665-3555 or by fax at (617) 665-3553. This recruitment is being given to fill one vacancy in the Substance Abuse Services department of Behavioral Health Services, a division of San Joaquin County Health Care Services Agency, and to establish an eligible list which may be used to fill future vacancies. Resumes will not be accepted in lieu of an application. A completed application must be postmarked or received online by the final filing deadline. This is a management-level position that is responsible for planning, organizing and directing substance abuse programs through Substance Abuse Program Managers, and may include managing assigned administrative functions. The Substance Abuse Services department is responsible for the coordination of alcohol and drug treatment efforts by providing a range of drug and alcohol treatment and prevention services to the residents of San Joaquin County. Services include outpatient, residential, and co-occurring treatment services. Prevention services offered include programs designed to build youth leadership skills, offer alternatives, and develop awareness of the impact of drugs and alcohol in our community. Education: Graduation from an accredited four year college or university with a major in psychology, social work, business or public administration, or closely related field. Experience: Four years of progressively responsible counseling or program management experience in a substance abuse or social crisis program, including one year at a level equivalent to Substance Abuse Program Manager in San Joaquin County service. Substitution: Possession of a master’s degree in social work, public health, public administration or a closely related field may be substituted for one year of the general experience. Laws, regulations, policies, and procedures relevant to the County’s Substance Abuse Program; principles and practices of management; methods and techniques individual and group counseling; physiological, psychological and sociological aspects of drug and alcohol abuse and dependency; community agencies and resources; program development; grants application and management; public relations techniques; budgetary principles and practices; information systems; basic computer and modern office automation technology and computer software programs relevant to department operations. Direct and participate in the development and administration of substance abuse prevention and treatment programs; prepare and monitor budgets; understand and interpret pertinent laws, rules and regulations; analyze data and draw logical conclusions; operate computers and related software; utilize computers and office automation equipment; communicate effectively, both orally and in writing. Alternatives is looking for a full time or part time Drug and Alcohol Counselor to provide groups and counseling to Monolingual Spanish speaking clients and English. We also have Domestic Violence, Parenting, Managing Emotions groups. Alternatives is willing to pay for employees to become a certified Domestic Violence facilitator. Drug and Alcohol certification, high school diploma or GED. 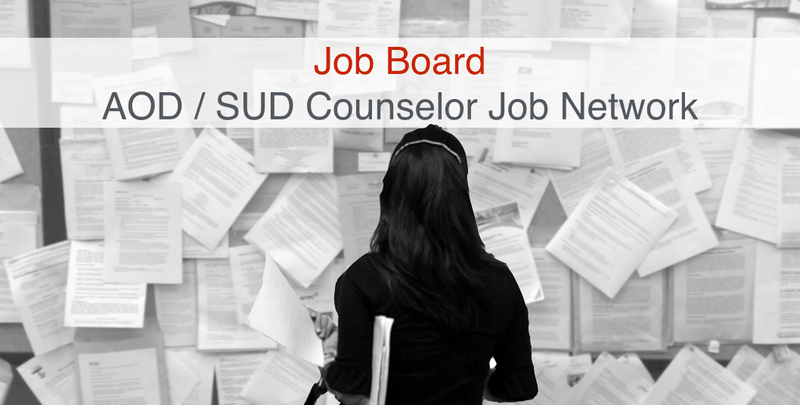 Job Summary: Provide supportive individual and group counseling to parenting and pregnant women with substance use disorders and possible co-occurring disorders, trauma, and re-entry challenges enrolled in inpatient SUD treatment. Support the organization’s mission, vision, and values by exhibiting the following behaviors: excellence and competence, collaboration, innovation, commitment to our community, and accountability and ownership. There is a maximum of 6 clients which 3 would be on your individual caseload. Anticipated Hours: This is a full-time position. This person must be available to work 40 hours per week, 3:30 pm to 12:00 am, Monday-Friday. There is a 90 Day probation period once you pass that you will be eligible for full kaiser benefits, Dental and Vision. You get 12 paid Holidays a year, PTO, and accumulate sick time separately. Knowledge: An understanding of gender-specific addiction and recovery, co-occurring disorders, individual counseling, and facilitation of educational groups such as CBT, DBT, Seeking Safety, domestic violence, trauma, relapse prevention, life skills, education and employment, parenting, and anger management. Experience working with perinatal populations, women and children, and families involved with CPS preferred. • At least two years experience providing counseling and facilitating groups. Counsel and advise pregnant and parenting mothers with substance use disorders and/or co-occurring mental health disorders. May counsel individuals, families, or groups or engage in prevention programs. Facilitate daily check in and several groups per week. Maintain a caseload of up to 10 clients. Provide case management and linkages to various organizations and services. Participate in multi-disciplinary team meetings. Provide written documentation of client progress to a variety of referral sources not limited to Family Drug Court, CPS, Criminal Court, etc. Provide transportation to clients as needed. Develop treatment goals and plans per ASAM criteria. Help clients develop skills and behaviors necessary to recover from their addiction or modify their behavior. Refer clients to other resources or services, such as job placement services and support groups. Complete and maintain accurate records or reports regarding the clients’ histories and progress, services provided, or other required information. Coordinate counseling efforts with mental health professionals or other health professionals, such as doctors, nurses, or social workers. Plan or implement follow-up or aftercare programs for clients to be discharged from treatment programs. Assess individuals’ degree of drug dependency by collecting and analyzing urine samples. • Therapy and Counseling — Knowledge of principles, methods, and procedures for diagnosis, treatment, and rehabilitation of physical and mental dysfunctions, and for career counseling and guidance. • Trauma—Knowledge of trauma effects on client population and the symptoms of trauma. Commitment to trauma-informed care. Certified SUD Counselor, Registered Associate Marriage and Family Therapist (AMFT), Registered Associate Clinical Social Worker (ASW), Registered Associate Professional Clinical Counselor (APCC), MFT, LCSW, LPCC Minimum 1-3 years experience in the field. Licensure hours available. Must be able to obtain a Department of Justice (DOJ) clearance. Individuals with serious criminal offenses in their background may not be able to obtain a DOJ clearance. Must maintain valid car insurance. To maintain gender staff balance to provide substance abuse treatment. We are currently seeking female counselors/group facilitators. For AOD Counselors: Must have a current CADTP/CCAPP Certification. Company Address: 4920 Avalon Blvd. – A certificate in alcohol and/or drug studies from an approved counselor certifying organization, or MFT or LCSW. – An AA or BA degree in Behavioral Sciences, Counseling, Clinical Psychology or related is required. The primary responsibility for Safety Center staff is to reduce injuries and save lives by empowering people to make positive life saving decisions. • Demonstrate commitment to Safety Center by welcoming and greeting clients in a courteous and professional manner. • Perform job duties in accordance with the Code of Ethics for Alcohol & Other Drug Counselors as outlined in the Safety Center Employee Handbook. • Maintain good business relationships with private and public organizations and government agencies to encourage their participation in and support of Safety Center ADP programs. Administration – Conduct client intakes; interpret and explain client contract, identify client needs, enroll them in the appropriate program, set up payment schedules and process payments per company procedures. Prepare DL107 and proof of enrollment certificates. Track client attendance and process completion certificates, or provide appropriate notification to the courts for non-compliance as required. Review and maintain accurate and timely records as required by the court, Title 9 and Safety Center’s curriculum. Compile and maintain accurate records of business transactions, office activities and classroom counseling sessions to assure the positive outcome of internal audits as well as audits conducted by county and/or state officials related to the daily operation of alcohol and drug-related programs and services provided by Safety Center. Program Delivery – Conduct education groups and face-to-face interviews using the ASI assessment tools and Safety Center’s Curriculum in accordance with Title 9 Programs or Drug Diversion Standards to assist clients in overcoming barriers to alcohol and drug dependency. Counsel individuals requiring assistance dealing with substance abuse problems through the DMV or court mandated programs. Refer clients to other support and/or employment services. Monitor condition of clients to evaluate successful completion of the program. Counselor Requirements -Maintain current certification and CEU’s as required by Title 9. Customer Service – Provide timely information in response to phone and mail inquiries about DUI programs to ensure positive client experiences. Display courtesy and empathy in difficult and emotional client situations. Development – Build on strengths by acquiring skills and knowledge to fulfill the roles and responsibilities required of the job position. Provide constructive ongoing counselor feedback to help enhance the overall performance of the ADP department and to help maintain high standards in program delivery. Other duties as required to meet the needs of our clients, our employees and Safety Center as a whole. While performing the duties of this Position, the employee is regularly required to talk or hear. The employee is frequently required to sit. The employee is occasionally required to stand; walk; use hands to finger, handle, or feel and reach with hands and arms. The employee must occasionally lift and/or move up to 25 pounds. Specific vision abilities required by this position include close vision, distance vision, peripheral vision and ability to adjust focus. Registered or Certified with CADTP or CCAPP. Since its inception in 1990 during the cocaine epidemic, LA BioMed/Options for Recovery has been in the business of helping women recover from alcohol and drug use to unite them with their children and family. Options for Recovery is a part of the Los Angeles Biomedical Research Institute (LA BioMed) at Harbor-UCLA Medical Center. LA BioMed/Options for Recovery’s mission is to provide comprehensive resource, education, support and recovery services to alcohol and drug abusing women 18 years old and older. We specialize with working with pregnant and parenting women by assisting them with their sobriety and process to reunite with their children through DCFS (Department of Children and Family Services). The Intake Support / Educator Counselor will assist as the second intake worker, maintain the client case load, and provide group and education classes using a variety of methods. Minimum of two year’s experience working with substance abusing women highly desirable. Skill and ability to facilitate client education groups. Intake, assessment and follow up. Knowledge, skill and ability to maintain appropriate therapeutic boundaries with clients, as per professional standards. Ability to interact professionally with staff, clients; their children and other professional agencies. Carry a client case load of max 6 including/providing documentation of all treatment aspects. Attend and effectively participate in all required staff meetings; case conferences; and trainings. Assist Director and Assistant Director to maintain optimum treatment environment including but not limited to supervision of onsite clients; group room preparation for workshops and ceremonies and agency tasks such as group coverage: Process Group Rotation, Counselor Group Rotation and Emotional Health.